With the spring job hunting season picking up pace across campuses in East China's Jiangsu province, today's vibrant job market reflects changes for both employers and employees. Putting too much emphasis on one's initial salary is an old story for graduates, with a company's development prospects and individual opportunities playing a more important role then ever before. "Instead of blindly pursuing high incomes, graduates nowadays put more stock in their personal feelings and sense of identity within the company," said an employer. Recruiters are now setting higher and stricter requirements for job seekers, requiring greater versatility and an international outlook while offering better pay for the best employees. 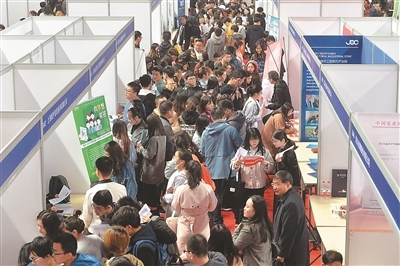 During a job fair at the China Pharmaceutical University in Nanjing on March 29, Li Baojie, vice president of the Lunan Pharmaceutical Group in neighboring Shandong province, said that postgraduates can enjoy a monthly take-home pay of at least 6,000 yuan ($893). The company's rapid transformation has boosted its surging need for professionals for traditional Chinese medicine laboratories and technical development departments. "Our company boasts a sound housing distribution system, the most appealing part of the deal for our employees; they can also enjoy a 30-day paid vacation every July and August," Li added. Universities, the bridge connecting students and enterprises, are also striving hard to enhance students' international competitiveness. Nanjing Agricultural University tells its own story. The school, riding the wave of the country's Belt and Road Initiative and the effect of agriculture weighing more in the international arena, has joined hands with overseas universities in various co-training programs and aims to cultivate more versatile and innovative professionals. The job fair kicked off at the school on March 29 and was also a reflection of its target to forge closer bonds between high-caliber personnel and enterprises which plan to or have already expanded businesses overseas. Shi Song from the university's foreign language school shared a new perspective, claiming that "professional skills plus foreign language fluency is no longer all that is needed to be a qualified candidate for the international market". He believes that enhancing students' overseas living and studying experiences are of the utmost importance and that universities can facilitate this by offering overseas internships and short-term training programs. Star enterprises retain their appeal for graduates. Take the agricultural company which has China's "Father of Hybrid Rice", Yuan Longping, as its honorary chairman as an example. The company provides new recruits with the opportunity to meet Yuan and, as a result, has attracted many job seekers.